There’s a lot to consider when you move up to a automatic gate opening system in the farmyard, and part of the picture is the weather you must deal with. Since the gate is exposed to the elements, you will want to know how it performs in rain and snow. How safe a system is it for users? How long a gate can you install with the system? Does it weigh a lot? Does it require a good knowledge of mechanics to install? Is there a way to lock it? You can find out these answers about a automatic farm gate opener by visiting a gate company’s website. 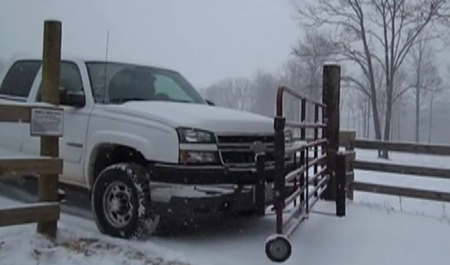 An automatic gate opener allows you to access a fenced area without getting out of the vehicle. That’s important because ice, snow and other elements create a mess. Anyone who gets down to open the gate will come back with slop in their footwear or worse. It will start building up inside the vehicle or mess up the tractor’s foot-well. The solution is to avoid getting out of the vehicle until it’s reached dry ground. The Gate locations isn’t chosen because of the elevation, so fence gates are not immune from drainage issues. A automatic gate simplifies the process by letting the vehicle push open the gate and it returns the gate to the closed position after the vehicle passes. In ice, snow, rain or mud, you never have to leave the vehicle. A bump automatic gate is low tech and low maintenance. It requires no electricity. 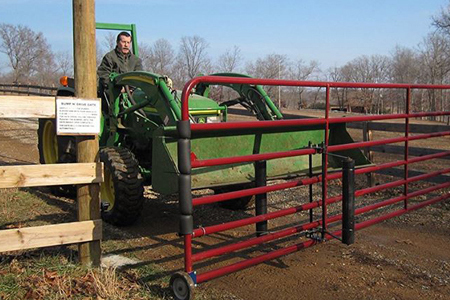 You can use an automatic gate for a number of vehicles including tractors, pickups and even semi-trailers. Pulling a trailer through the gate behind a pickup is not a problem. The gate is latched when you approach, but the act of pushing it with the bumper frees the gate to swing open. After the vehicle passes, it closes and latches. It stays open only for seconds but the time might vary with the length of the gate. If it’s over twelve feet long, a gate requires a wheel at the end to enable opening and closing.